Everyone knows how to love, and everyone deeply wants to love. But it isn't quite that simple to bring your love to life. All of us have consciously or unconsciously learned wrong ideas, drawn wrong conclusions, and formed love-negative beliefs and habits that cause us to lose the trail oftentimes. 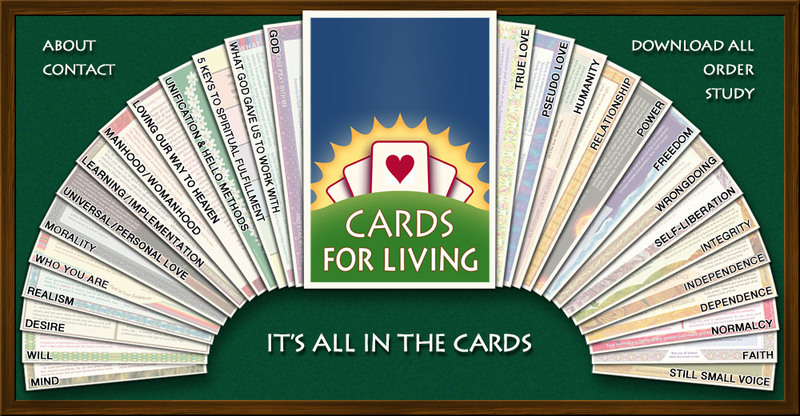 That’s why we offer the Cards for Living, which contain key insights on the most important areas of life, and help clear up the confusions that inhibit the free flow of love. May the cards give you fresh inspiration to live in a way that will satisfy your heart and soul, and help and heal others. Find love! Share love! Get great at loving! For that you need to understand more about what love is. Here's the real scoop on love. Love brings so many beautiful feelings, intentions, and actions into life! This card describes the various colors in love's rainbow. Selfishness promises to help us but only hurts us—and others. This card exposes the disappointments and disadvantages of selfishness in life and love. Love is often confused with "pseudo love" (which, of course, is why many people fear love). This card clears up the confusion, and helps restore love's good name. Our precious humanity is our greatest treasure, but often we judge and reject our most exquisite qualities. This card defends our passion, creativity, and will to serve. Only our humanity can save the world. Bring your desire, need, fragility, and will to love into life! We're all connected, and we need each other. Home is where the hearts join. We can only be fulfilled when we accept that and act accordingly. Here's a method to help you build strong and dynamic relationships! Follow Plan B to create relationships like every heart wants and needs. Each of us has huge power, regardless of wealth, skill, or status. This card describes many marvelous powers you'll recognize in yourself and everyone you know. There is no such thing as a powerless person—only one who has suppressed, denied, or misused their power. Use these tips to regain full awareness and use of your power. You’re always free, regardless of what you’ve been, done, or experienced. You have the freedom to change your life for better or worse. Use it well. You are free to choose however you wish, but beware: selfish choices will hurt and imprison you. This card explains how. How to heal the regret, the guilt, and the pain we’ve caused to others when we’ve done wrong. Guilt is a compass that points us back to rightness—but often our reactions to guilt make things worse, not better. We’re naturally free, but we bind ourselves with limiting ideas of who we are and what we can do. Reclaim your freedom! Let them go. To love and live fully, you need to break free of wrong ideas of who you are. This card tells how. Integrity is living in a way your heart is happy with, and not ashamed of. This card reinforces what your heart knows about true integrity. People have many false ideas about integrity, but our hearts know better. Take this quiz; prove to yourself how well your heart actually understands integrity. Healthy independence is not being independent of others. It's independence from everything—internal and external—that holds you back from loving fully and being who you really are. Everyone wants to be independent, but the common ideas of independence are very UNhealthy. Understand the problems of unhealthy independence, so you can correct them! Healthy dependence is when I depend on you and you depend on me—and we're both reliable for each other. What a joy! It's like heaven on earth. People fear dependence, associating it with passive, unfair, irresponsible forms. But we need each other, and need to find wise and appropriate ways to depend on each other. To be true to your heart, you have to live outside the box called "normal," above the painfully low standards of common culture. What's become natural in this world is unnatural to our true nature. True normalcy is living as the person God made you to be—the person you are. Having faith in God, in life, in yourself—what does it mean? And how to have faith? Anyone can build unshakeable faith on these four cornerstones. The power of faith is often wasted because, without realizing it, we invest our faith-power wrongly. Learn how to avoid the common pitfalls of "false faith." How to develop a truly close and loving intimacy with God, through love, prayer, and responsible dependence on God. This card extends a personal invitation from God to you (to stay with God even when you're not praying, meditating, etc.). To touch lives and heal hearts, God needs your help, and you need God's help. Here's how the partnership between you and God works. God has plenty of guidance to give, but few make full use of it. Read this card and let the Still Small Voice work Divine magic in your life! God endowed each one of us with many wonderful gifts. This side describes our uniqueness, ability to love deeply, access to understanding, finely-tuned conscience, and flexibility. The list of our God-given gifts continues, with beautiful feelings, subtle sensing (intuitive awareness), creativity, Divine companionship, the Still Small Voice, and absolutely free will. Do our bad deeds mean we're bad people? No, it means we're free. We are good, but it's still up to us what we choose to be. We are always in our formative years, being formed by our own decisions—our Go or No go to each of our beautiful impulses and characteristics. True agape (universal love) is not merely good will towards all. It is love that's passionate, feeling, caring—not for "everyone in general," but for each one, specifically. Close personal love is our native habitat—we need it. But like any great treasure, it makes people greedy, and that's not loving. For true love, leave selfishness behind. What a gift our gender characteristics are, when we're willing to embrace them and live them. This card will make you hungry for the glory of true manhood. Vive la difference between men and women! This card paints an inspiring portrait of true womanhood. Desire is our key to unlocking the abundance God created for us to have. This card explains how healthy desire, combined with real love and appreciation, creates a circle of nurturance for all. This card explains the difference between healthy desire, which gives life and fulfillment to both the lover and the beloved, and unhealthy desire, which always disappoints in the end. The mind is a wonderful servant—but to serve us well we must align it with good intentions and guide it with our innately wise heart sensibilities. A poorly directed mind creates a lot of problems—problems everyone recognizes all too well. This card reviews many common ones, and describes a way to overcome them all. The mind has great creative power, and often, that power feels out of control. But you can steer your mind—and you must, for the sake of love. Think it's hard to know what's best? The mind is often confused, but the heart is feeling enough, present enough, and sensitive enough to steer us right. Learning opens life up and unlocks its treasures—if our learning is true and helpful. Learn here how to take responsibility for what/how you learn. The truth will set you free—but only if you live it, implement on it. Applying what you know is a NECESSARY part of learning. The requirements for moral living are the same for all, at all times, in all places. You will find them on this card—and in your heart. Learn to recognize immorality and the popular attitudes that cause it. You'll be empowered for good by studying the everyday examples on this card. Free will is a powerful tool that opens many doors. With good will, we can love freely, cooperate wholeheartedly, and create heaven on Earth. Will is so powerful—it can create great good or a royal mess. Learn how SELFISH will wreaks havoc in our lives and loves. What's realistic to expect is not cast in stone—it's a result of the way we think and act. Realistically, our dreams can come true—if we fulfill their real requirements. True realism depends on conditions. The examples on this card will improve your understanding of what is realistic—and what is not. Like flowers growing toward sun, like baby birds yearning toward sky, our hearts grow toward love. How fast we grow depends on how willingly we embrace love's higher responsibilities. Find spiritual fulfillment within the daily activities of your everyday life by applying these five powerful principles. Unification is a simple but powerful way to realize Unity with Life, using the most universal, natural, and uplifting of all human impulses: LOVE. Here's a sweet and effective way to connect with God and Celestial Beings (like Jesus, Buddha, your guardian angel, etc.) Try it, you'll see!